During the US election campaign, Donald Trump said that he would dismantle the country’s domestic climate change policies, and withdraw the US from international climate agreements, most notably the Paris agreement which came into force earlier this month. In the week since he became President-Elect, he has given every indication that he is serious in his intentions. So how should the rest of the world respond? It is tempting to indulge in wailing and gnashing of teeth, but in the real world of a Trump Presidency, this is unlikely to be effective. What is needed is a proportionate response. In France, Nicolas Sarkozy has proposed what may well be the most efficient and effective measure, a climate change tax levied upon all US goods imported into Europe. How large should such a tax be? If it is to be proportionate, it should cover the harm caused to the Earth from the production of the goods, a harm that will not be reflected in their price if the US presses ahead with the unfettered use of fossil fuels. Let’s consider some ballpark numbers. The Gross Domestic Product of the US in 2015 was about $18 trillion. The US emissions of greenhouse gases in the same year were about 7 billion tonnes of CO2 equivalent. Dividing one quantity by the other, we find that every thousand dollars of US production involves the emission of about 0.4 tonnes of CO2 equivalent. Applying these mean values as an ad valorem tax on imports of USA goods to Europe results in a tax of about 6%, if the European valuation of harm is used, or 10% with the US valuation. These are higher, but not dramatically so, than Sarkozy’s proposal of a 1 – 3% tax on US imports. How much might such a climate tax on US imports raise? The EU presently imports about 400 billion Euros of US goods and services per year. So a 6% tax rate would raise about 25 billion Euros per year, and a 10% rate would raise about 40 billion Euros. If imports of US goods and services have a price elasticity of -1, these revenues would be about 6% or 10% lower respectively. If adopted, this idea could be refined further by levying higher rates on US goods that released a great deal of greenhouse gases during their production, and lower rates on others. And of course, in order not to be hypocrites, we in Europe would introduce a strong, comprehensive climate change of about $150 per tonne of CO2 equivalent on our own activities too. But that is only common sense. ← Hinkley C: Do climate benefits make it a good deal after all? Sarkozy’s proposal is not allowed. WTO rules only permit border taxes if there is an equivalent domestic tax. France’ carbon tax proposal did not make it. Border taxes are the exclusive competence of the EU. The EU would not permit France to have a border tax even if the WTO would. The WTO would not permit the EU a border tax unless there is an EU-wide carbon tax, which is very unlikely. Besides, border taxes are unlikely to change the behaviour of the party being sanctioned — here because the USA exports very little energy-intensive products to the EU. Border taxes do, of course, reduce trade. The border tax revenue typically does not outweigh the welfare loss due to lost trade. So it looks like a European climate change tax is needed for another reason than to stop us being hypocrites. Don’t take Tol seriously. (Well duh.) Note his premise that Trump can trample all over treaty commitments but everyone else needs to politely comply. Why, it’s almost as if Tol approves of bullying! Not at all the case, I’m sure. Anyway, for right now Trump has done nothing, and Sarkozy has simply laid down an appropriate poltical marker. Good for him. What Trump wants is not allowed as well, so bollox to that! We live in times where there are more important things than WTO rules. Rules we’re made in a world without Trump. When speaking about manufactured exports, the main component of their CO2 footprint is the electric power used to run factories. On average, the US electric system is less CO2-efficient than Europe’s… but more CO2-efficient than Germany’s, which just happens to be Europe’s export powerhouse. Again, should the US tax German cars to account for the relatively high CO2 emissions involved in their manufacture? A more logical case for a tax on internationally-traded goods would be to hit countries that are improving their CO2 efficiency very slowly, that is, those are decarbonizing slowly. But the US has decarbonized its economy, since 2000, faster than Europe’s (though the difference is very small). And far more quickly than the world average. Your last sentence, ‘if the US presses ahead with the unfettered use of fossil fuels’, says it all. There is no ‘unfettered’ or ‘unrestrained’ or ‘business as usual’ use of fossil fuels. There is use of fossil fuels that is fettered, restrained by people’s innate desire to do more with less. So far this desire, in the US, has trumped all the regulations and carbon trades and renewable quotas implemented in Europe. 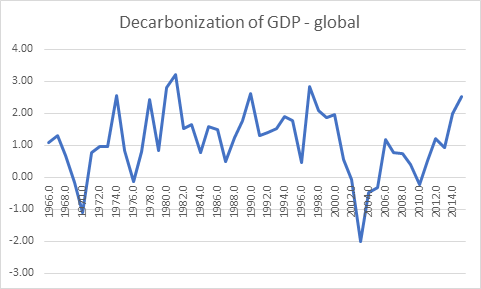 A carbon tax on US exports would only be justified when there is some evidence that Trump is in fact slowing down the US economy’s rate of decarbonization, which is to say the rate of improvement in CO2 efficiency of GDP.